The key code number is stamped on the plate attached to your key set. 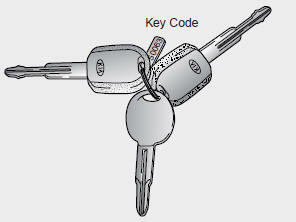 Should you lose your keys, this number will enable an authorized Kia dealer to duplicate your keys easily. Remove this plate from the key ring and store it in a safe place. Also, record the code number and keep it in a safe and handy place, but not in the vehicle. Leaving children unattended in a vehicle with the ignition key is dangerous even if the key is not in the ignition. Children could place the key in the ignition and operate the power windows or other controls, leading to a serious accident. Never leave a child alone in the vehicle, with or without keys. Leaving your sub key with a parking attendant will ensure that your vehicle’s trunk, trunk lid release, glove box compartment and rear trunk access may not be unlocked in your absence.